The BridgeAthletic Building Blocks Series is a set of 5 exercises that can be performed at the practice field, in the gym, or on the pool deck by athletes with a basic level of training experience and proficiency. Methodology: Partner-up and add these bodyweight exercises into your next practice or workout. Integrate these movements to add teamwork and some variety to your championship preparation. Show us the partner exercises in action for a chance to win some Bridge swag - post your pictures and videos on social media, tag @bridgeathletic and use the hashtag #BridgeBuilt. Movement: A great reaction drill to test recovery and preparedness for the upcoming workout. Start by facing each other. One partner holds a tennis ball in each hand – the “dropping” partner. The other partner is going to attempt to catch both balls before they hit the ground – the “catching” partner. Both partners raise their arms to chest height, keeping their hands level to each other. The “dropping” partner places his/her hands in the middle. The “catching” partner place his/her hands on the outside of the “dropping” partner’s hands. When both are set, the “dropping” partner releases both balls without warning, and the “catching” partner needs to catch both balls before they hit the ground. Do the prescribed reps then switch partners. Bridge tip – Focus on not anticipating the drop of the tennis balls, but reacting to the movement of the balls being released. Don’t rush between reps.
Movement: Start standing next to your partner with your backs against the wall and your feet hip-width apart. Squat down against the wall until your quads are parallel to the ground. Ensure that your lower-back is pressed into the wall throughout the movement. Hold this position for the prescribed time or until your legs start shaking. Bridge tip –Think of pressing your belly button into the wall behind you to keep a tall and flat back throughout. Movement: A fun team building exercise. 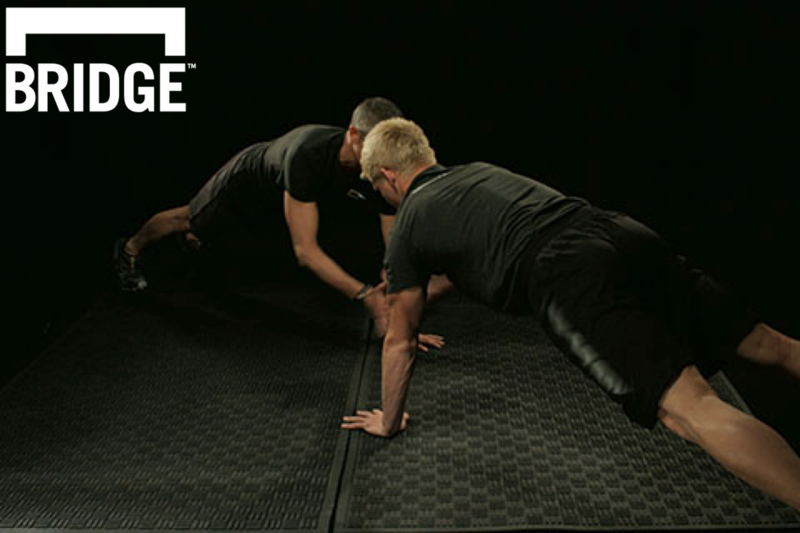 Start in a pushup position facing each other. Perform a pushup. As you return to the start position, each partner raises their right hand and reaches across their midline to clap their partner’s hand, while bracing their midsection to keep their hips inline. Return the right hand to the start position, perform another pushup and this time clap with the left hand. Perform the prescribed number of reps for each arm, alternating each rep.
Bridge tip – Remember to brace your mid-section to keep your lower-back flat to the entire movement. Change partners each time you perform this exercise. Movement: This exercise adds a coordination and proprioceptive component to a standard jump. Start standing with your feet shoulder-width apart. Squat and take your body down to the ground in to a sitting position. As you reach the ground, tuck your knees to your chest, roll backwards in a tight ball, then roll forwards. As you roll forwards use your arms to create some momentum to help you plant your feet under you and launch your body off the floor into the jump segment. As you jump, aim to reach higher than your partner’s outstretched hand. Control your body through the air to land softly and repeat the movement for the prescribed reps, then switch partners. Bridge tip – When starting out use your arms to swing forward and push off the ground with your hands. As you improve, use this method less and less. Work on landing softly each time. Movement: Start lying on your back, head to head with your partner. Make sure your heads are slightly to the side of each other. Link up with your partner by gripping each other’s arms at a 90-degree angle at the elbows, knees bent and feet on the floor. Press your lower-back into the ground and bring your bent knees to your chest in a controlled movement. Pause. Return your legs slowly to the start position. Touch your feet lightly to the floor, then repeat the movement for the prescribed reps or time. Bridge tip – Keep your lower-back pressed into the ground to initiate the movement and use your partner to stabilize and counteract your movement. We hope you enjoy this bodyweight partner Building Block series.